Happy New Year! Welcome to 2014 and all the opportunities it brings! Wow, 2013 has flown by! For this year I will continue to focus this Blog on Critical Infrastructure issues and augment it with some discussions focused on some of the key questions and topics I think will affect all of us this year. o What will happen with the NIST Cybersecurity Framework? 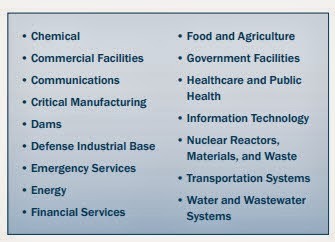 o What news and events will surface for the 16 critical infrastructure areas designated by PDD-21? o How will the electric industry react to the new NERC CIP Version 5 mandates? And the NIST Cybersecurity Framework? o This is a continuation of the areas reviewed last year including the SANS Global Industrial Cyber Security Professional (GICSP) certification activities and new ICS-security emphasis from other cyber-security agencies outside of the US ICS-CERT and even overseas with ENISA, etc. So, this should be an interesting year and one that keeps us all busy. Overall, though, my objectives for this Blog are to a) educate, b) entertain and c) make you think about today’s new challenges to our security and critical infrastructure resilience.